If you would like to see a larger image of the pictures, please click here for the donation page! Please do not make copies of these pictures. 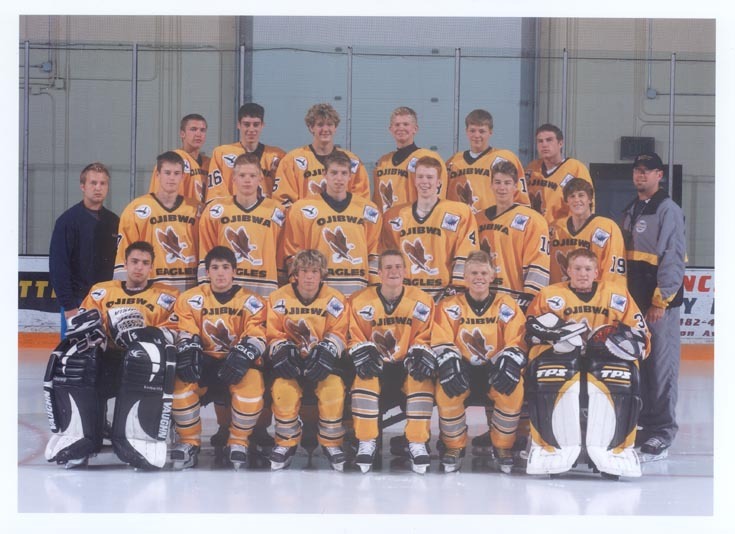 Back Row L-R: Jake Dunstan, Brian Smusz, Jeff Haapapuro, Chris Hendrickson, Logan Wolosek*, Aaron Baker. Asst Coach Ben Hatinger, Jason Julien, Jason Porkka, Trevor Morrison, Ted Greeley, Evan Stephens, Corey Engelhart, Coach Scott Nevenhoven. Seated L-R: Micah Robbins, Eric Bausano, Cody Smith*, Peter Lorinser, Michael Bernardy, Pat Greeley. other Players * played 5 games or less: Kyle Elmblad*, Ryan Greenley*, Anthony Loreti*, Patrick Tiesling*, Josh Chapman*. 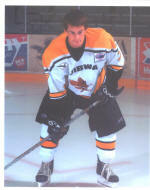 Players: Jeff Erkkila, Mike Babcock, Mike Bernardy, Peter Lorinser, Fred Kooser, Brian Smusz, Tony Bilich, Chris Hendrickson, Eric Kattelus, Corey Engelhart, Anthony Loreti, Dan Rosseau, Rick Delecke, Ryan Greenley, Jason Porkka, Matt McCarthy, Kyle Elmblad, Jason Julien, Patrick Greely -goal, Rob DeVaun -goal. 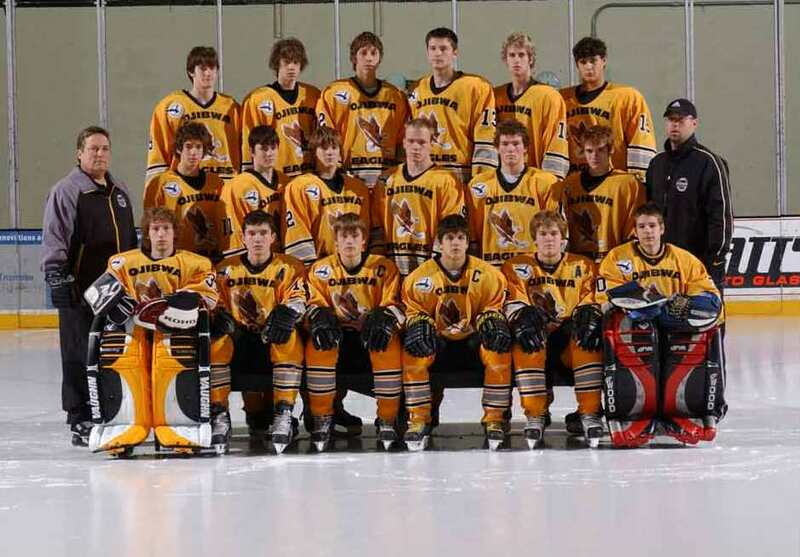 Please Contact the webmaster if you have a picture of this team! Back Row L-R: Michael Babcock, 2, 3, Tim Viola, Ryan Greenley, 6. Middle Row L-R: Asst. Coach Ed Kattelus, 2, Tyler Ries, 4,5,6,7, Coach Scott Nevenhoven. Seated L-R: Rob Devaun, 2, 3, Jeff Erkkila, 5, Andy Brand. 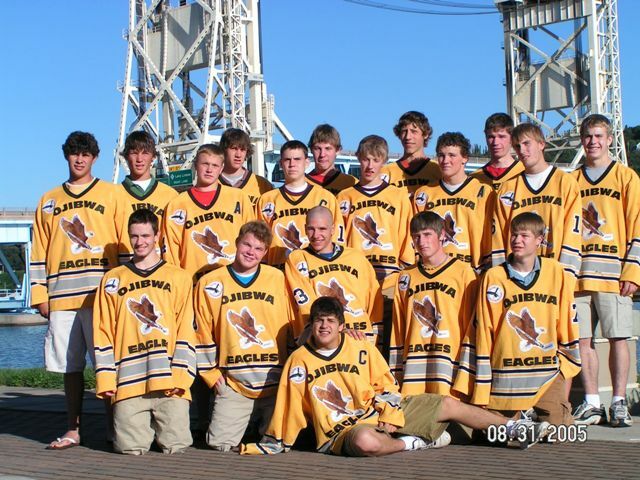 other Players: Garrett Russell, Thomas Schulz, Alex Redmond, Kyle Waisanen, Richard Ledy, Jake Hauswirth, Rick Delecke, Eric Kattelus, Kyle Rowe, James Krusic, Kyle Elmblad. Please Contact the webmaster if you can identify these players! Middle Row L-R: 1,2,3,4,5,6, Pete Radecki. Kneeling L-R: Tyler Ries, 2,3,4,5, Blake Hietala. other Players: James Krusic, Jake Hauswirth, Mitch Pulver, Kyle Rowe, Lyle Bennett, Rich Ledy, Kevin Stormer, Adam Diedric, Ben Otradovec, Adam Bumstead, Josh Farnam, Mike Gugin, Chad Therion, Brandon Panich, Brian Rukkila -goal, Andy Brand -goal. Kneeling L-R: 1,2,3, Tyler Ries, 5, Ben Caneba -goal. 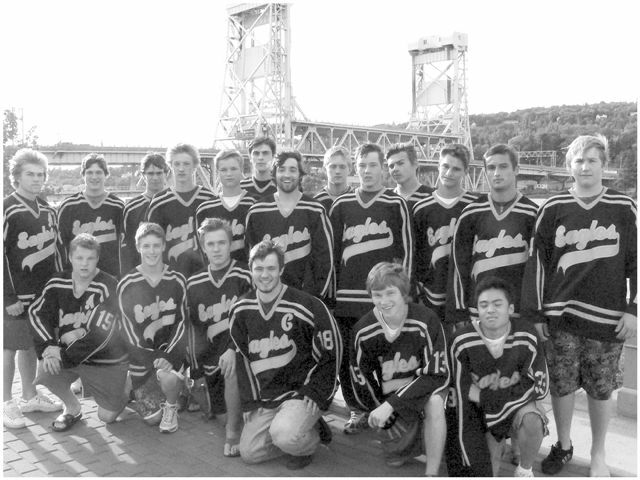 other Players: Blake Hietala, Josh Shingler, Brandon Zeigler,Chad Therrian, Andrew Hall, Matt Adamski, Mike Gugin, Josh Lopez, Zack Tegge, Lyle Bennett, Brendan Tuchowski, Ray Nolan, Michael Baldwin, Tom Marshall, Michael Stevens, Cody Sivonen, John Aho, Patrick Rice, Evan Loughman, Brian Rukkila -goal. Players: Miiko Karstu, Taylor Laneville, Alex Benson, Evan Loughman, Jordan Nelson, Danny Coca, Matt Gage, Ryan Faria, Matt Adamski, Tyler Ries, Michael Stevens, Collin Duggan, Josh Shingler, Thomas Friedrich, Kyle Fiebernitz, Miles McGrew, Justin Reilley, Jeff Taunton, Nico Peterson, Chris Jackson -goal, Jake Hilton -goal. Players: Robbie Payne, Alex Roy, Jordan Peters, Thomas Friedrich, Josh Borgen -(Baraga, MI), Matt Gage, Mike Stevens, Ryan Faria, Mike Gullan, Bryant Froberg, Evan Loughman, Justin Reilley, Collin Duggan, Nick Vande Kieft, Kyle Fiebernitz, Trey Saari, Jackson Unteriner, Jaered Elwell -goal, Jordan Roy -goal. Coach Dan Giachino, Asst Coach-GM Ed Kattelus, Asst Coach Brent Peterson, Asst Coach Matt Hampton, Asst Coach Mark Maroste. Please contact webmaster if you have a picture of any Houghton Teams!